The use of technology in the educational setting can provide support for professional development early in a teacher's career. The purpose of this qualitative exploratory study was to examine the use of an electronic discussion board in a field-based block of courses as a place where 17 preservice teachers could share experiences and ideas. The researchers examined the nature and development of the discussions over one semester. The study found three major benefits: (a) computer mediated communication extends discussions beyond the classroom; (b) the discussion board became a place for professional support and community; and (c) preservice teachers' reflective thinking developed over time as a result of the discussion board. The electronic discussion board appears to be a promising way to enhance and support existing structures for preservice and inservice teachers' professional growth. Nicholson, S.A. & Bond, N. (2003). Collaborative Reflection and Professional Community Building: An Analysis of Preservice Teachers’ Use of an Electronic Discussion Board. Journal of Technology and Teacher Education, 11 (2), 259-279. Norfolk, VA: Society for Information Technology & Teacher Education. Retrieved April 24, 2019 from https://www.learntechlib.org/primary/p/14609/. Berge , Z . (1997) . Characteristics of online teaching in post-secondary formal education . Educational Technology , 37 (3) , 38-47 . Dewey, J. (1927). The public and its problems. Athens, OH: Swallow. Dutt-Donner , K.M. , & Powers, S.M. (2000) The use of electronic communication to develop alternative avenues for classroom discussion. 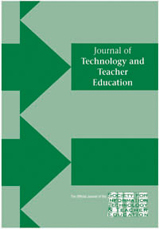 Journal of Technology and Teacher Education, 8(2), 153-172. Foster, D. (1996). Community and identity in the electronic village. In D. Porter (Ed.) , Internet culture. London: Routledge. Hawkey , K . (1995) . Learning from peers: The experience of student teachers in school-based teacher education. Journal of Teacher Education, 46(3), 175-183. Rogoff , B . (1994) . Developing understanding of the ideas of communities of learners . Mind , Culture and Activity , 1 , 209-229 . Schrum, L. (1993). Social interaction through online writing. In R. Mason, (Ed.) Computer conferencing: The last word. Victoria, British Columbia: Beach Holme, (p. 193). Schrum, L. (1991). Teacher education goes online. Educational Leadership, 49(3) , 39-42. Smith, S. (1987). The collaborative school takes shape. Educational Leadership, 45(3) , 4-6. Walther , J . (1996) . Computer-mediated communication: Impersonal , interpersonal , and hyperpersonal . Communication Research , 23 , 3-43 .